That nagging pain in your back, or just not being able to straighten up fully upon rising from a chair, is likely an indication that improper sitting posture is producing the first signs of of what may eventually develop into a severe, chronic back problem. Back specialists also tell us that poor sitting postures, before or after lifting or other heavy activities, put us at much greater risk of incurring a painful and debilitating back injury. However, with proper, regular use, The Original SuperRoll™ lumbar support will help you eliminate most of the common back pain that develops as a result of postural stress..
Dimensions: 15 ½" x 5 ½" x 2". The Original SuperRoll™ will attach, via its hook and loop strip*, to most chair backs constructed of cloth. If not, or if a more firm position is desired, use the enclosed elastic strap to hold the roll in place on any chair or automobile seat. 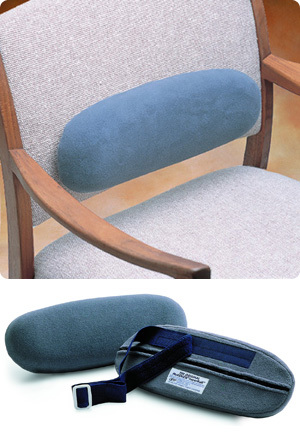 Stretch the strap around the chair back with the loop strip facing outward. Attach the roll and slide the strap down toward the seat. Sit in the chair with your buttocks as far back in the seat as possible. Lean forward and adjust the support (and strap) until it is centered just above the belt line. When you lean against the backrest, the hollow in your low back is now firmly supported. Everyone is different in shape, so the support may have to be moved up or down by no more than one inch. Initially this position will feel strange. Remember, it will take a few days to adjust to this new position.